Some all-grain brewers base of volume of wort they collect on their desired pre-boil volume. 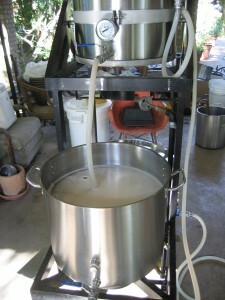 They aim for a pre-boil volume that they can boil down to their batch volume in 60 to 90 minutes. No matter what the weight of their grain, the volume of wort they collect is always the same. This approach can work well for moderate strength beers. However, when brewing higher gravity beers, you progressively lose extract efficiency as the weight of the grain bed increases. This is because you’re collecting the same amount of wort from more grain. 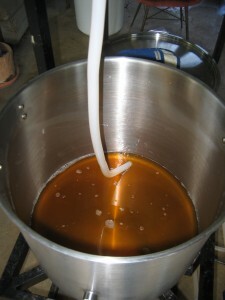 Some homebrewers simply accept the loss in extract efficiency, so that they won’t have to spend the additional boiling time to evaporate volume from their wort. An additional problem with this method is that brewers end up collecting too much wort from grists designed for low-gravity beers. If you want to base the amount of wort you collect on the size of your grain bed, you should collect around 0.60–0.65 gallons of wort per pound of grain (5.0–5.4 L/kg). If you continuously sparge, this should correlate to the final runnings of your beer having a specific gravity of 2 to 2.5° Plato (~SG 1.008–1.010), with a pH around 5.8. In fact, you should measure your pH, if possible, and use that as the deciding factor when to quit sparging. This is better than collecting a fixed volume of wort per pound of grain. If you are brewing a low-gravity beer, and the amount of wort you collect is low enough that you will yield less than your batch volume after boiling, add water to your kettle to reach a reasonable pre-boil volume. If you are brewing a big beer, you may have to boil longer than usual to reduce the volume of work to your projected batch volume. A dipstick calibrated to your kettle will help you gauge how fast you are collecting your wort. If you batch sparge, wort collection can go very quickly. 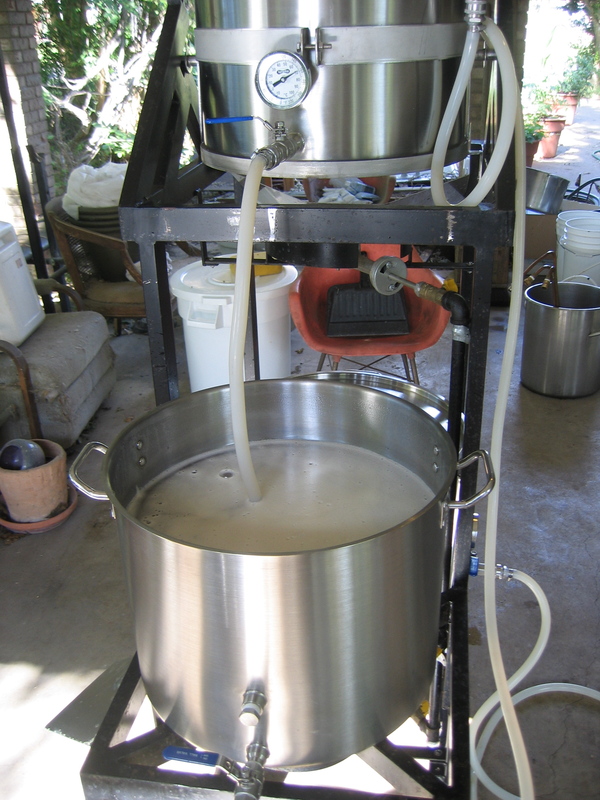 There is no benefit to draining the first, second, or third wort (if you collect a third wort) slowly. However, if you collect your entire pre-boil of volume in a very short amount of time, you still have to wait for it to come to a boil. As such, you might want to consider collecting the first wort, and heating it in your kettle. While the first wort is heating, recirculate your second wort, and then just wait. When the first wort approaches a boil, then run off your second wort. The extended contact time between your grain bed and first batch of sparge water may help your extract efficiency somewhat. If you are collecting a third wort, wait until your first two worts almost come to a boil before collecting your third wort. If you continuously sparge, extending the time of wort collection leads to higher extract efficiencies. However, the returns diminish quickly. For example, although the difference between collecting your work over 60 minutes compared to 30 minutes is relatively large, the difference between collecting your wort over 90 minutes vs. 120 minutes is smaller. Once you know how much wort you are going to collect, and the amount of time you’re going to collect it in, you can calculate your rate of wort collection. For example, if you are going to collect 6.5 gallons (25 L) of wort over 90 minutes, your rate would be 0.072 gallons per minute, or 9.2 fl. oz. per minute (270 mL/min). Break this down into 5-minute increments, or some other time period that works for you. For example, collecting 9.2 fl. oz. of wort in one minute is equal to 46 fl. oz. per 5 minutes. 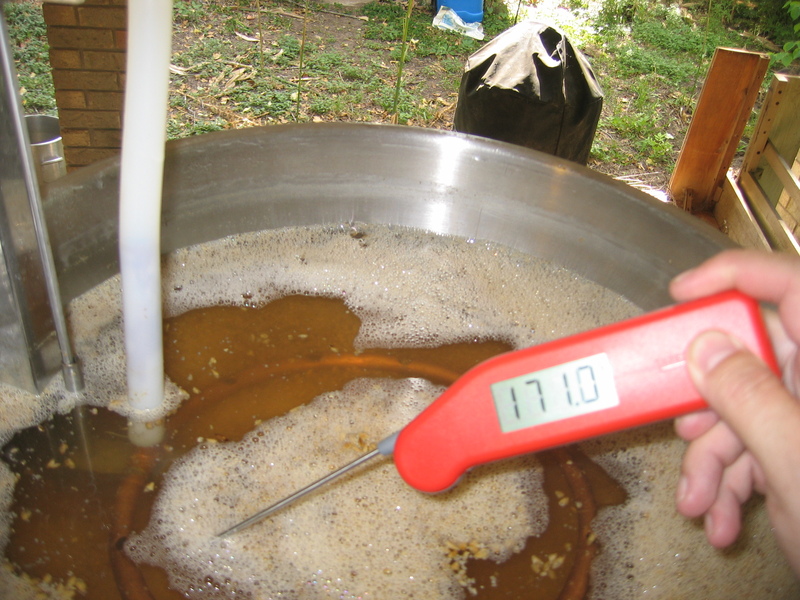 Use a dipstick calibrated to your kettle and a timer to guide your wort collection. You will likely need to adjust the ball valve on your lauter tun numerous times over the course of wort collection to get your flow rate correct. If your flow rate suddenly slows greatly, open the ball valve all the way for a second or two. It’s likely that the tube is clogged with grain pieces and opening the ball valve all the way will clear these. If your set up precludes you from running off your wort directly to a heated kettle, use an intermediate vessel to move wort to the kettle. For example, if your lauter tun sits on a countertop, you may be used to setting your kettle on the ground to collect the wort. What you should do is place the kettle on its heat source, and run the work off into pitchers (or any other small vessel). If you use two pitchers, you can be running the wort off into one, then switch to the other when the first one is being poured into your kettle. Heating your wort as you collect it is especially important when brewing a full-bodied beer. If the temperature of your wort drops as it sits, unheated, in your kettle, the amylase enzymes will continue to work on any available carbohydrates. drying out your beer. The temperature of your grain bed, not your sparge water,is what’s important. These multipliers work for me and may or may not be correct in any given brew shed; however, they demonstrate a concept.